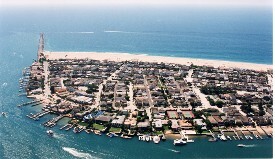 Located at the tip of the Balboa Peninsula, Peninsula Point is one of Newport Beach’s oldest residential neighborhoods. The community is far away, for Newport standards, from the John Wayne Airport, Fashion Island, and the business districts of Newport Center and Irvine: each of these locations can be reached in about 20 minutes by car. But for the residents who live here, the seclusion is more than worth it. Peninsula Point offers the charm of yesteryear in an idyllic water location with homes dating back to the 1920’s. The Point’s residents have access to some of Newport’s quietest ocean beaches as well as the scenic entrance to Newport Harbor. Unlike the rest of the peninsula, the Point is made up of largely single-family residences. The community’s homes represent a good mix of Eastern Seaboard, Cape Cod, Mediterranean, traditional, and contemporary styles. All of the homes are custom and many offer top-of-the-line features and details throughout. From Bellevue Lane, the beaches can be accessed via the strada that connect the front yards. For the rest of the homes located on the interior lots, the sidewalks are an excellent and fun way to get to the beach. The beaches here have no boardwalk separating the homes from the sand. As a result, they seldom, if ever, become crowded. Additionally, they are some of the longest in Newport, reminiscent of those on Central Florida’s Atlantic Coast. Once you step out into the sand, it takes a couple of minutes to reach the water. The famous “Wedge,” located at the southern tip of the peninsula, draws a large crowd whenever the waves become “humongous” (10-20 feet). This occurs about twice a year, on average. Rarely do the waves become dangerous and when they do, the lifeguards advise that only extremely experienced swimmers enter the water.